Located in the northwest of the Sichuan Basin (surrounded by mountains), Jiangyou belongs to the Mianyang district. The city is conveniently served by transport (Figure 1), with highway (Chengdu �C Mianyang, 160 km), then national road (Mianyang �C Jiangyou, 40 km). Via Mianyang (the second largest city in Sichuan), it is connected by flights to several of China's major cities such as Beijing, Shanghai and Guangzhou). 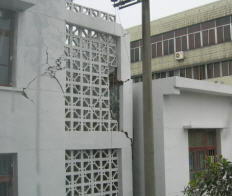 Jiangyou city covers an area of 2719 km2 and has a population of 880,000 including a population of 634,000 in the rural areas. 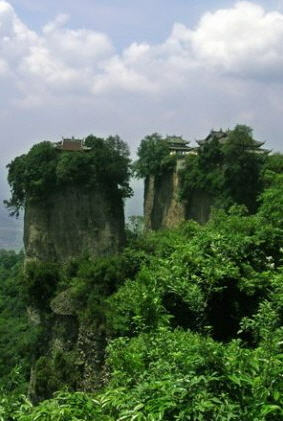 Jiangyou lies at the southeast of the Longmen mountain range, upstream from the Pei River. It has a humid subtropical climate with an annual average rainfall of 1,100 mm. The average temperature is 16°C, with a maximum temperature of 39°C in summer and minimum of -5°C in winter. In the Mianyang region, it has 55 species of nationally protected animals including the giant panda and the golden snub-nosed monkey, and more than 20 varieties of rare herbs. Forest coverage is 45%. 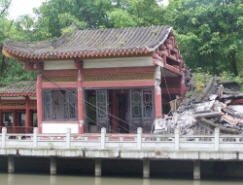 Jiangyou (http://www.regenttour.com/chinaplanner/ctu/ctu-sights-libai.htm) is noted for its beautiful scenery, long history, and deep cultural roots. 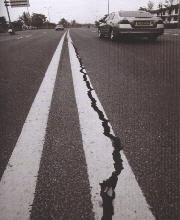 It is the homeland of the greatest romantic poet Li Po (701-762, of Tang dynasty). About 1,100 of his poems remain today. Jiangyou also features many historical relics of the Three Kingdoms period (220-280). 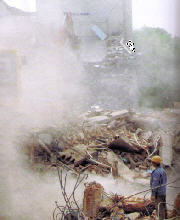 More recently (in 2005), two dozens of ancient gunpowder sites were discovered in the caves of Mount Laojun. This discovery will contribute a great deal to the Chinese ancient technical history. Jiangyou also boasts many impressive landscapes such as Mount Doutuan (Figure 2), Buddha Cave and Bailong Cave which belong to the forty kinds of Karst precipitation formation in the area. In the mountains, some wild and rare orchids can also be found (Figure 3). It is worth mentioning too that one of the famous Masters of kungfu Shaolin, Haideng is native of Jiangyou. 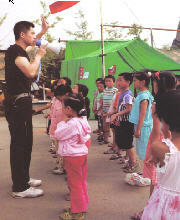 In the city there is the Haideng Kungfu Institute on his honour (Figure 4). 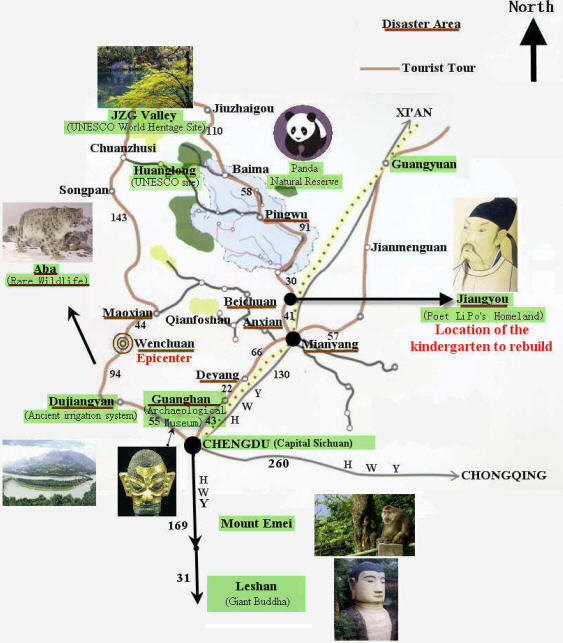 Most interesting point is that Jiangyou is situated on the way from the provincial capital Chengdu to the UNESCO world heritage sites JZG valley and Huanglong Scenic Area (~300 km away) as well as to Wanglang National Nature Reserve near Pingwu (~170 km away). Established as a nature reserve in 1965, Wanglang National Nature Reserve sits on the transition zone between the Tibetan Plateau and the Sichuan basin, where elevations range between 2,300 and 4,980 m. It covers an area of 320 km2 and encloses five different ecosystems, from rocky 5,000 m snow-covered mountain peaks to alpine old-growth forest. It shelters a multitude of rare and endangered species such as black bears, brown bears, red pandas, takin, musk deer, and rare varieties of pheasants. Plants, from rare orchid species to valuable medicinal herbs, grow in abundance. The area's tall trees, thick undergrowth bamboo and flowing streams combine to make it a perfect habitat for giant pandas (Figure 5). 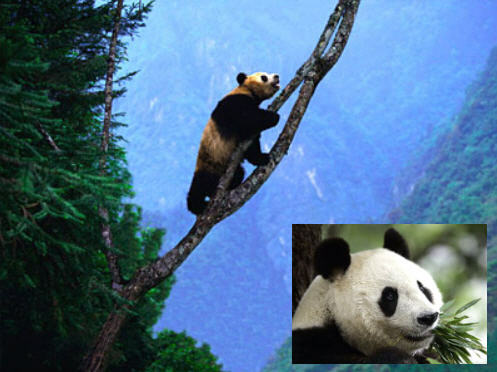 Official counts estimate that of China's approximately 1,000 pandas remaining in the wild, 80% live in northern Sichuan, with more than 25% of them in Wanglang National Nature Reserve. 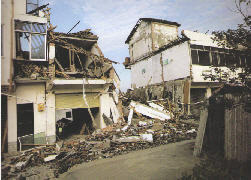 Unfortunately, the huge earthquake (7.9 degree, Richter scale) on May 12th, 2008 caused considerable damages to Jiangyou, which is 120 km far away from the epicentre Wenchuan. 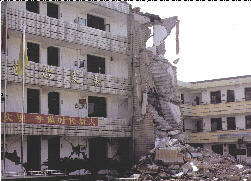 The following pictures are some witness of the damaged situation in Jiangyou.